On April 6 and 7, 2008 the international committee of the artistic director of documenta 13 met in Kassel for the first time. The Goethe-Institut Hongkong is pleased to see Hong Kong taking up a role, when Oscar Ho, Director MA Programme in Cultural Management, Chinese University of Hong Kong, was announced to be a member in the international finding committee for an artistic director of documenta 13. The international committee proposes the artistic director of the documenta 13 to the supervisory board of documenta und Museum Fridericianum Veranstaltungs-GmbH, who will then be officially confirmed by the board. The supervisory board consists of 5 representatives of the city of Kassel, 5 representatives of the State of Hessia and 2 representatives of the Federal Cultural Foundation. documenta 13 will take place from 09. 06. until 16. 09. 2012 in Kassel. We will stay till lights go out. BRAVO ! Microwave ! TED and UVA. Love You. Blue Man Productions, best known for Blue Man Group, is looking for a seasoned Creative Director of Research & Development to conceive and design concepts in all creative areas, including: sets & scenery; props; instruments; gadgets; special effects; graphics and other cool,inspiring new stuff. The Creative Director will be able to solve creative problems through innovation and creativity. Reporting to the Senior GM/Production, he or she will oversee and direct the work of the creative teams: Associate Creative Directors; R&D members; outside Creative Contractors & Consultants. He or she will ensure that as new projects are developed, their progress is continuously communicated to the CCO & Creative Directors, and that creative feedback is effectively communicated and applied to the projects teams. * Ensure that Blue Man Group values and artistic vision are understood and supported across the organization. * Partner with the CCO and Creative Directors to conceive, articulate, iterate & execute creative concepts in all areas: sets and scenery; props; instruments; gadgets; special effects; graphics, etc. * Provide leadership for research and development; produce and communicate design ideas. * Oversee and/or assist with the execution of design and research ideas as directed by the Senior GM/Production. * Minimum 7+ years leadership experience in creative, collaborative environments required. * Minimum 5+ years experience in fields of special effects, production design, special events or magic industry strongly preferred. * Proven track record of leadership in large scale design and concept execution. * Fluency in production and communication of design ideas, including: development of models; sourcing materials and fabrications; producing drawings and models. Please do not mail any materials to us at this time. Environmental sustainability and climate change are issues which must no longer be ignored by anyone, any industry or any academic community. The pervasive technology, ubiquitous computing and HCI community is slowly waking up to these global concerns. The Nobel Peace Price 2007 was awarded to Al Gore and the Intergovernmental Panel on Climate Change (IPCC) “for their efforts to build up and disseminate greater knowledge about man-made climate change, and to lay the foundations for the measures that are needed to counteract such change”. The citation highlights the urgency of the fact that information and awareness around causes and implications are necessary but not sufficient to combat climate change. Action is required. 1. Providing people with environmental data and educational information – via mass communications such as film, TV and print and new media, or micro communications such as pervasive sensor networks (cf. Participatory Urbanism and Ergo at urban-atmospheres.net; real-time Rome at senseable.mit.edu; biomapping.net; placeengine.com) – may not trigger sufficient motivation to get people to change their habits towards a more environmentally sustainable lifestyle. This workshop seeks to develop a better understanding how to go beyond just informing and into motivating and encouraging action and change. 2. Pervasiveness can easily turn invasive. It has already caused negative consequences in biological settings (e.g., algae in lakes and oceans, kudzu vine in the southeastern US, rabbits and cane toads in Australia). Pervasive can be a dangerous term when the ecological impacts are disregarded. Pervasive technology is no different. In order to avoid further serious damage to the environment, this workshop aims to lay the foundations to start re-considering the impact of pervasive technology from an ecological perspective. 3. Addressing the 21st century Digital Divide: The mass uptake of pervasive technology brings about digitally networked and augmented societies; however, access is still not universal. Castells and others use the notion of the ‘digital divide’ to account for those whose voices are not heard by this technology. Initially, the divide was seen only between the first and third worlds and then between urban and rural, but with today’s near ubiquitous coverage, the digital divide between humans and the environment needs to be addressed. Virtual environments could give the natural world an opportunity to ‘speak’. How can we address imbalances? For example, sensors embedded in the environment could allow creeks and rivers to blog their own pollution levels, local parks can upload images of native bird life. Can the process of ‘blogging sensor data’ (sensorbase.org) assist us in becoming more aware of the needs of nature? How can we avoid the downsides? 「燈陸．亞高高」聲光互動媒體藝術展將於4月11日隆重揭幕! 來自英國的United Visual Artists及本地LED藝術家Teddy Lo將分別透過作品VOLUME 及稀孔(PHAEODARIA)，為你帶來聽覺及視覺的獨特體驗!! 所有工作坊及座談會報名名額已滿，多謝各位支持!! “A-Glow-Glow” Macro Interactive Media Arts Exhibition is going to kick off on 11th Apr!! 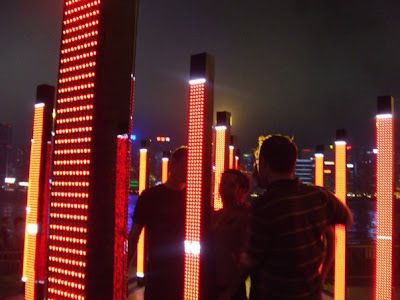 Starring “VOLUME” by United Visual Artists(London) and PHAEODARIA by Teddy Lo(Hong Kong), the two macro interactive media artworks about light, sound, and frequencies will bring you the exceptional audio and visual experiences! RESERVATIONS FOR WORKSHOPS AND SEMINARS ARE ALL FULL!!! Thanks so much for your great SUPPORT!! Don’t miss the exhibition! Gallery Benten 17 announces INTERSECTIONS, an inter-cultural art project featuring 9 emerging artists, 3 each from Hong Kong, Japan and Korea. INTERSECTIONS attempts to interpret the traditional, cultural and technological influences which are crucial for understanding today’s globalised societies, where identities and social relations are constantly being challenged. This exhibition facilitates the crossing of these paths to allow new connections to be made. This is the inaugural launch of what will be an annual event featuring artists from these three locations. The organisers are pleased to announce the list of 100 leading galleries from around the world who will exhibit at the HKCEC from 14 – 18 May. See the full list of participating galleries at www.hongkongartfair.com and make sure you book your tickets before 7 May to enjoy 20% discount – HK$120 per person. High-profile works up for sale include Andy Warhol’s 1962 Avanti Cars from Ben Brown Fine Arts, London worth an estimated HK$29million, Nue aux Bras Elevés from Max Lang, New York and a Damien Hirst offered by Seomi & Tuus, Seoul. Peres Projects from Los Angeles will be exhibiting a solo show of work by controversial artist Terence Koh. There will also be plenty to offer for those new to buying art and many galleries will be exhibiting accessibly priced works from emerging talent as well as limited editioned works from more famous names. In addition to the buying and selling, at the heart of the Fair is an exhibition featuring Hong Kong’s most exciting emerging artistic talent. Mirage, curated by Sabrina Fung, who was also responsible for the Hong Kong Pavilion at the Venice Biennale in 2005, looks at the play between illusion and imagination through large-scale installations, videos, sculpture and other works. Featured artists include Homan Ho, Catherine Y M Lee, Esther L M Yip and Wong Chung Yu. Asia Art Archive (AAA), the non-profit arts education centre dedicated to visual art from the region, is running an education programme during the Fair. ‘Hong Kong Conversations’ is a series of talks by a group of renowned collectors, artists and experts that will include Honorary Patron of the Fair, Sir David Tang. Other speakers include influential Hong Kong-based Swiss collector, Monique Burger, Tobias Berger of Para/Site Art Space, young Hong Kong artists Lam Tung Pang and Chow Chunfai and Elaine Ng, editor of contemporary art magazine ArtAsiaPacific. Finally, ART HK is pleased to announce its association with SHIFTING SITES: Cultural Desire and the Museum, a one day conference organized by Asia Art Archive and the Chinese University of Hong Kong’s Department of Cultural and Religious Studies which will be held on Saturday 17 May, International Museum Day. A satellite event to the Fair, the conference will address the growing trend among governments, notably in Asia, to allocate major resources towards creating one-stop cultural districts and question whether such fabricated districts can hold their own against the vibrancy of long-established art scenes in cities like London and New York. Speakers include Sheena Wagstaff, Chief Curator of the Tate Modern and Yuko Hasegawa, Chief Curator of Tokyo’s Museum of Contemporary Art. The conference is supported by the Home Affairs Bureau of the Government of the HKSAR and open to the public.